The workers of Ilam Petrochemical Plant rallying outside the factory in spring protesting the non-employment of local workers and the layoff of 11 experienced workers of the plant. 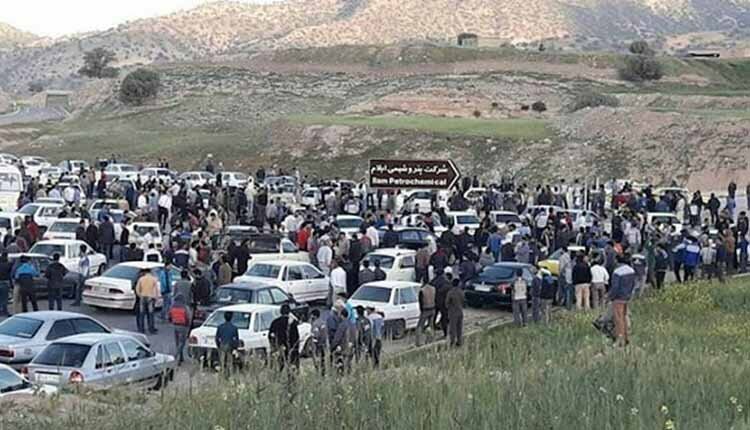 The workers of the Ilam Petrochemical Plant were sentenced to prison and lashes on after being charged with “disrupting public order and peace” on October 14 by the 104th Branch of the Ilam Penal Court. The workers who were each sentenced to six months behind bars nd 74 lashes are identified as Afshar Rashidi, Anvar Rashidi, Sadegh Rostami, Nader Khaki, Mohammad Saleh Gheitasi, Sadegh Kakakhani, Tohid Gheitasi, Saeid Gheitasi, Amin Arkovazi, Hojjat Esmaili, Abbas Mozzafari, Ali Kakakhani, Mohammad Heidari and Ali Nejat Azami. Another worker identified as Milad Dousti has been sentenced to two years of prison and 74 lashes. The workers had staged a sit it for a few days outside the factory in spring closing all the roads leading to the factory. They were protesting the expulsion of 11 of their colleagues and the non-employment of local workers. Established in 2003, Ilam Petrochemical Co. manufactures and markets petrochemical and chemical products including ethylene, propylene, and polypropylene. This is not the first time that workers have been sentenced to flogging for demanding their rights as labor activism in Iran is treated as a national security offense. independent labor unions are not allowed to function, strikers are often fired and risk arrest, and labor leaders are consistently prosecuted under catchall national security charges and sentenced to long prison terms. More recently, 15 staff members of the HEPCO manufacturing company in Markazi Province, Iran, were issued suspended prison and lashing sentences for striking for unpaid wages, reported the state-run ILNA news agency on October 28, 2018. “Based on the ruling issued by Branch 106 of the Criminal Court in Arak [city], each of these 15 workers has been ordered to serve a year to two and a half years in prison and be flogged 74 lashes,” reported ILNA. “These are preliminary verdicts and the workers have lodged appeals,” added the report. “At the same time, the court has suspended the sentences for five years considering the workers’ lack of criminal records and the special circumstances surrounding their demand for several months of unpaid salaries,” added the report.